This week, The Flash rolls out an old sci-fi trope: the memory-sifting device that traps the user and then threatens them with the possibility of death while sifting through memories. Yeah, this one’s a classic. It does have variations, though: sifting through one’s own memories, through dreams, or — as is the case for “Memorabilia” — the memories of other people. The Flash puts a further twist on the premise by sending two teams of heroes through two separate sets of memories. One trip ends quite happily, while the other does not. The episode starts off with some adorable: a West-Allen family outing at an ice skating rink. Well, the rest of the team is also there, but it’s made clear that Barry had the idea for Iris, Nora, and himself to go skating together. That’s interesting, since Barry (playfully) leaves Nora in the dust while trying to teach her, allowing Iris to step in and be the more patient parent. These moments are always really cute, but does anyone ever overhear Nora calling people roughly her age “dad” and “mom”? We know Cicada heard her that one time — does he assume the Flash is older than he looks or something? Or is Central City weird enough that literally no one questions its weirdness? Speaking of Cicada and weirdness: Sherloque has ordered the delivery of a machine that allows people to dip into each other’s minds. Team Flash’s plan for the episode is to connect with comatose Grace, Orlin/Cicada’s adoptive daughter, and wake her up so she can call off Cicada’s attacks. After mentioning that thoughts and memories could be viewed by people who use the machine together, Sherloque slyly volunteers Nora and Barry for the procedure. Nora, who monologued a message to Future Eobard Thawne at the beginning of the episode, understandably does not want to risk her father seeing what’s going on in 2049. So when everyone is gone, Nora sneaks up to the machine and goes into Grace’s brain alone, assuming it’ll just be a quick, simple hop onto a little girl’s brain waves and out again before anyone realizes. Wise and well-examined decision, there, Nora. You really are your father’s child. Inside Grace’s memories, Nora finds the little girl’s consciousness and can actually interact with her. Unfortunately, the portal Nora planned on pulling Grace through in order to wake her up disappears before they can get through it. Nora and Grace wander around the girl’s memories (many of which are obviously warped by nostalgia) in search of the portal, but they can’t find it. No big deal, save for the annoyance of being trapped in the mind of a kid — until things turn sour and Grace, having caught on to Nora being a meta and having spent her comatose hours overhearing her uncle’s anti-meta growls and grumbles, turns on Nora. As all this is happening within Grace’s memories, Team Flash have discovered the unconscious Nora and realize they should probably go in and get her. When Iris and Barry hook themselves up to save their daughter, though, they don’t end up in Grace’s mind — they end up in Nora’s. While this would have been a perfect opportunity to have the other shoe drop on Nora’s duplicitous, pro-Thawne actions, Barry and Iris really only see some childhood memories. Barry is thrilled because he thinks he’ll probably never see Nora at the age she is in the memory, but Iris is less than happy about her future as a mean mom. 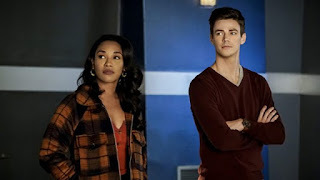 Iris and Barry’s trip to Nora’s past (and their future) turns out to mostly be a way for the both of them to come to terms with their roles as parents. They, unlike Nora and Grace, can’t interact with the past — only observe. Iris has to watch her future self shout at little Nora and she worries over the type of mother she’s destined to become. Caitlin gets in contact with the memory travelers by using the brainwave device she used to need for communicating with Killer Frost. She tells them they need to break through false memories, and the portal will open up. Nora has to break down the overly heroic and happy image Grace has of her uncle, and Iris and Barry have to find the truth in Nora’s memory, which is that she’s replaced a loving, caring, and understanding Iris West-Allen with a villainous one because… kids, I guess? These things have to be done while running avoiding getting caught by the memory’s “guardians” — Cicada for Grace, Reverse Flash for Nora. Barry and Iris successfully break apart Nora’s false memory, but Nora is not so successful. Grace is fully on Cicada’s side, to the point where it’s revealed that her guardian Cicada is actually an older version of herself. This, on top of an earlier reveal during Nora’s memory that Cicada continues killing long enough to rack up a body count of more than 150 people, makes me think that villainy might run in the family. The intrepid brain-traveling family returns to proper life, having learned much about each other (but not the stuff Nora didn’t want them to learn). Iris learned that she really isn’t going to be as terrible a mother as Nora has led them to believe, and Nora has learned that she kind of made her mother the villain of her childhood for unfair reasons. The whole West-Allen family learns that, by Iris starting her blog/news site in 2019, she’s already started changing the future Nora knows, where the blog isn’t started until 2021. Caitlin’s been learning stuff while they were gone, too — namely, that Grace has a hunk of dark matter satellite shrapnel in her skull, which might explain her deep slide into megalomania so early in life. Barry, meanwhile, has come out of it all with a plan: use the metahuman cure Cisco and Caitlin have been developing on Cicada. Iris! Please, please hire a graphic designer for your website before you get any other employees. Your site is hideous. Cisco and Ralph had a subplot. It was kinda nice. Seeing the Flash Museum was really fun and full of cute little in-jokes: a cover of a real The Flash comic featuring the comic book version of Cicada, for example, and toy Flash phones with the show’s theme song as the ringtone. So Grace, the inspiration for Orlin to go out and kill all metas, is technically a meta thanks to some dark matter-infused shrapnel in her skull. Oh, the irony. Barry says he wants to use the meta cure on Cicada even though Cisco and Caitlin promised each other they’d never use the cure on anyone who wasn’t a willing volunteer. Not to go all Eleanor Shellstrop at the end of a The Flash review here, but I seriously hope Team Flash says “fork you” to ethics and goes with that plan. If they won’t kill the guy who racks up over a hundred and fifty murders, a little shifting of the moral goal posts is the next best idea.